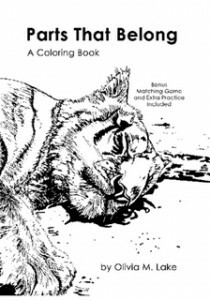 Parts That Belong A Coloring Book is a ‘Find It’ activity book aimed at ages 3-10. This book lends a creative and engaging approach to teaching students and home-schooled children singular and plural possessive nouns. Teaching techniques included are: coloring, seek-and-find, read aloud, repetition and matching. It is a great book if your children or students are just starting punctuation with possessive nouns, students need extra practice or you are homeschooling. Parts That Belong A Coloring Book is a 32 page perfect-bound paperback book. The confusion on how to properly punctuate possessive nouns, even into adulthood, influenced me to write this book. I felt targeting the younger audience makes a bigger impression in the long term and will ingrain it more permanently. This is seen when children retain words they learnt in another language when they were young, into their adulthood; or feel more comfortable around a specific type of people because of there experience or exposure to them at a young age.